It’s not hard to find meaningful quotations about unity. 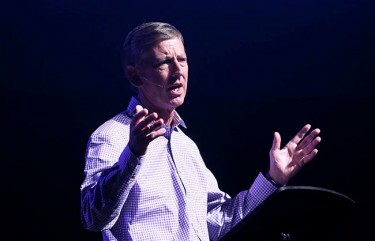 GCU President/CEO Brian Mueller stressed the importance of unity in his Chapel talk Monday morning. But the best place of all to learn about it is the Bible, as Grand Canyon University President/CEO Brian Mueller attested Monday morning in the first Chapel of the 2015-16 school year. 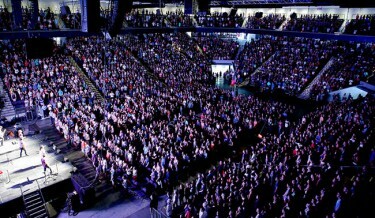 The setting in GCU Arena was a testament to unity in and of itself. Nearly all of the 7,000 seats were filled with students and staff. GCU, Mueller said, is not unlike one of those early churches Paul, John and Peter were working so hard to unite. 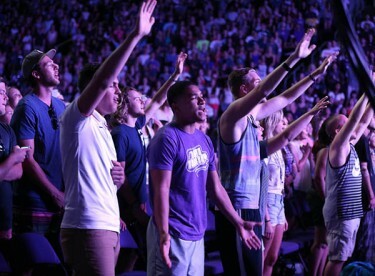 Nothing GCU has achieved in recent years — its incredible growth, expanding educational programs, service to the community and welcoming events such as Move-In — could have been achieved without like-minded people coming together with one goal. “The challenge is the walls that create barriers and separate people,” he said. A near capacity crowd turned out for the first Chapel of the school year. To illustrate his point, Mueller talked of watching the movie “McFarland, USA,” in which a down-on-his-luck high school coach, played by Kevin Costner, finds himself coaching cross country in a poor farm town in California. The coach wins multiple state championships by getting people from diverse backgrounds to learn to work together. The biggest cause of poverty, Mueller said, is barriers. “We’re here for breaking down the walls, bringing down the barriers and connecting,” he said. First, the University must continue its quest to help west Phoenix through its work with Habitat for Humanity, Alhambra High School and the Phoenix Dream Center. Students sing and worship during the performance by the Chapel band. Finally, there’s the issue of mental health and depression. Mueller said his father and brother both suffered from the disease, and together with Associated Students of GCU President Cody Dumas he is determined to help GCU students who are afflicted with it. The Chapel band played three pulsating songs at the start of the service. “No one on our campus should be left alone with that,” he said. The only way that happens is with unity. “We can be transformative,” Mueller said. And as the University has shown, it’s more than just talk — it’s actions. For a replay of Mueller’s talk, click here.